We were all there in force on August 19th for a very special screening of Charlie Chaplin’s The Great Dictator, in honour of our very own great dictator Becca. Becca, the Founder of MNFC, has departed to foreign lands where hopefully she will spread the word of film club far and wide. And for her surprise send off, we took her to the Cinema Museum, Kennington on a sunny South London evening, where we were greeted by the Curator Roland who gave us a fascinating insight into the museum itself, the history of the building, and the local connections to Chaplin. It was great to see so many people there to celebrate for our leader, and we will all miss Becca very much. We had hoped this Tuesday Review would be her last hurrah; but I suppose emigrating and packing got the better of her in the end. Maybe there’ll be a Sri Lankan addendum. But I thought I’d record our fantastic evening with our Founder in the meantime. The Great Dictator was Chaplin’s first talkie. Sound had been incorporated in film for years before, and some critics thought Chaplin was becoming old-fashioned by his continued use of the silent movie for his Tramp. However, this film stands testament to his forward-thinking. The film revolves around a Jewish barber, who bears an uncanny likeness to rising leader Adenoid Hynkel, the dictator of Tomania. 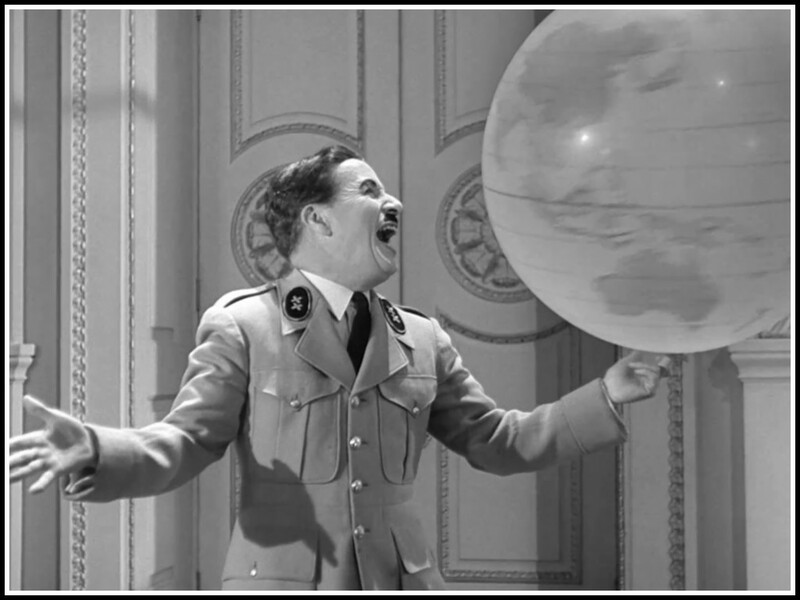 In satire, Chaplin makes clear, bold comments on the insanity of the Nazi regime and rise to power of Adolf Hilter. What makes this truly incredible is that production of the film started in 1937 at a time when many Americans saw Hitler as an ally rather than an enemy, and it was released prior to America’s entry into WWII. When Hynkel vows first to destroy the Jews, and then the Brunettes (“Brunettes are trouble makers. They’re worse than the Jews”), it is clear that Chaplin is exposing the farcical base of fascism and the egotistical nature of a dictator (“Dictator of the world… you make me afraid of myself!”). His animated demagogic style which even scares the microphones is helpfully translated from a pre-prepared manuscript (…”General Hynkel has just referenced the Jewish people”). And his rivalry with the Dictator of Bacteria Napaloni (“de grosse peanut, de cheesy ravioli”) is amazingly funny, from the moment he first appears in the Tomanian train station. The view from the ghetto gives a contrast to all this slapstick absurdity, with many scenes evoking a sense of fear and persecution – but incredibly there are laughs aplenty to be had here, from frying pans bashing storm troopers, to shaving a man with full orchestral backing, and hiding sixpences in the puddings. These two worlds come together in a finale in which Chaplin reaches out to the audience, and with no comedic intent faces us head on, delivering a most powerful speech about humanity. His last, famous speech, has been reviewed by many critics as jarring and feeling sanctimonious, and the film’s strengths are solely in it’s comedy set-pieces. For me, the whole film was entirely filled with much more depth than this; and the content of the final speech is a relevant today as it was back then. You can see a transcript here, and decide for yourselves. Certainly, Chaplin himself said that had he known the full horror of the concentration camps and the Nazi atrocities, he “could not have made fun of their homicidal insanity”. Adolf Hitler banned the film in Germany and in all countries occupied by the Nazis. Allegedly, curiosity got the best of him, and he had a print brought over from Portugal. History records that he screened it twice, in private, but history did not record his reaction to the film. Chaplin said, “I’d give anything to know what he thought of it.” However, it was screened once to a German audience. In the occupied Balkans, members of a resistance group switched the reels in a military cinema and replaced a comedic opera with a copy of this film, which they had smuggled in from Greece. So a group of German soldiers enjoyed a screening of this film until they realized what it was. Some left the cinema and some were reported to have fired shots at the screen. That’s all for now. All that’s left to say is Bon Voyage Becca and good luck! And… this really is NOT a democracy! Madame, your Founding leadership of MNFC was superb.